Gross domestic product, or GDP, measures the output of the economy. Last quarter, the U.S. economy produced $20.4 trillion worth of goods and services. That’s 4.1% higher than the output of the same three months in 2017. It’s the fastest growth since the third quarter of 2014, when the economy grew 4.9%. Economists worry that inflation picks up when GDP growth rises. If investors share those concerns, the stock market could sell off. 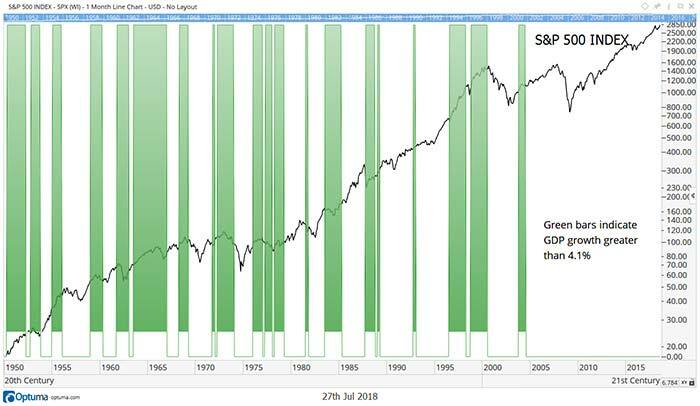 The chart below shows investors shouldn’t worry. Green bars highlight times when GDP grew by 4.1% or more. Stock prices generally rise at those times. In quarters when GDP growth is at least 4.1%, the S&P 500 Index gains an average of 2.1%. The S&P 500 rose in 71.3% of those quarters. In a typical quarter, the S&P 500 gains an average of 1.8%. The index delivers a gain 62.5% of the time in a three-month period. So, the test shows strong GDP growth is good for stocks. This means investors should consider aggressive positions for the next three months. Aggressive positions include stocks of smaller companies since those are the stocks that generally lead the market higher. There are also exchange-traded funds (ETFs) that track small stocks. Among the most popular small-cap ETFs is the iShares Russell 2000 ETF (NYSE: IWM). The Russell 2000 is a widely followed index of small-cap stocks. Less well-known is the iShares Micro-Cap ETF (NYSE: IWC), which tracks even smaller companies. Options are available on both of those ETFs. A call option gives the buyer the right to buy 100 shares of the ETF at a specified price at any time before a predefined date. Call options are less expensive than the ETFs. For example, there is a call on IWC with a specified price of $105 that allows a buyer to buy 100 shares at any time before December 21. This call costs about $600. If IWC moves up to $115 before the call expires, the options would be worth at least $1,000. The buyer can sell the position at any time because there is no obligation to buy the ETF. In this example, the buyer could take their 67% gain and move on to the next trade. Call options on IWC are an aggressive trade. But the GDP report tells us now is the time to trade aggressively.